If you need a spare chain, please click here: Product ID: 1242504.
you can fix the hex screw again and use the chain saw. 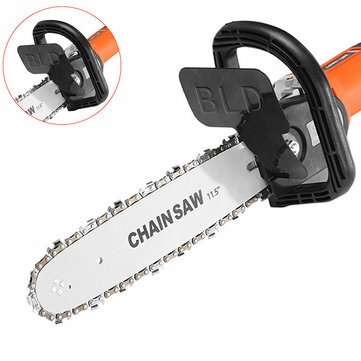 This Chain Saw Bracket Set uses the 100 angle grinder and the grinder is not included in this package,pls understand. Its input power depends on your own 100 angle grinder, so it is not a certain number. It has plastic handle which is very convenient for carrying. Safety of sawing, effectively improve the efficiency of your work. The chain with outer guide oil hole, can let you use it more convenient. These saw chains are an improved version of the Titan saw chain and are semi professional chains.